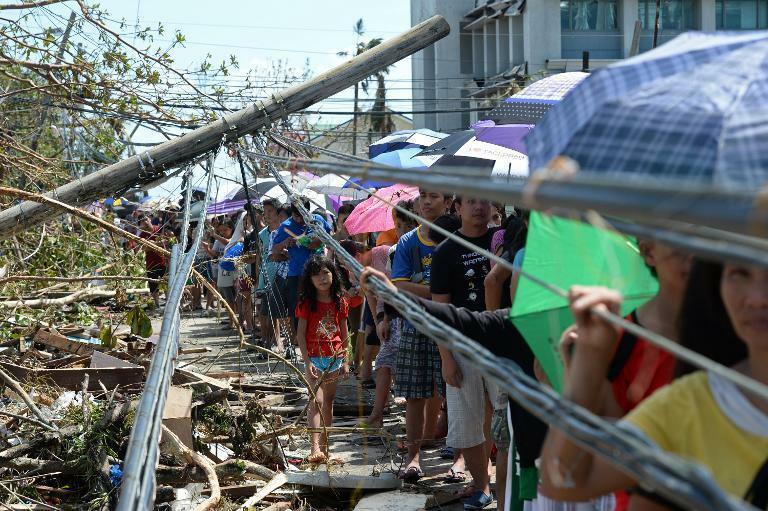 Survivors of a super typhoon that may have killed more than 10,000 people in the Philippines were growing increasingly desperate for aid Monday, as authorities struggled to cope with potentially the country's worst recorded natural disaster. As the sheer scale of the devastation slowly became clear, rescue workers appeared overwhelmed in their efforts to help countless survivors of Super Typhoon Haiyan, which sent tsunami-like waves and merciless winds rampaging across a huge chunk of the archipelago on Friday. Hundreds of police and soldiers were deployed to contain looters in Tacloban, the devastated provincial capital of Leyte, while the United States announced it had responded to a Philippine government appeal and was sending military help. 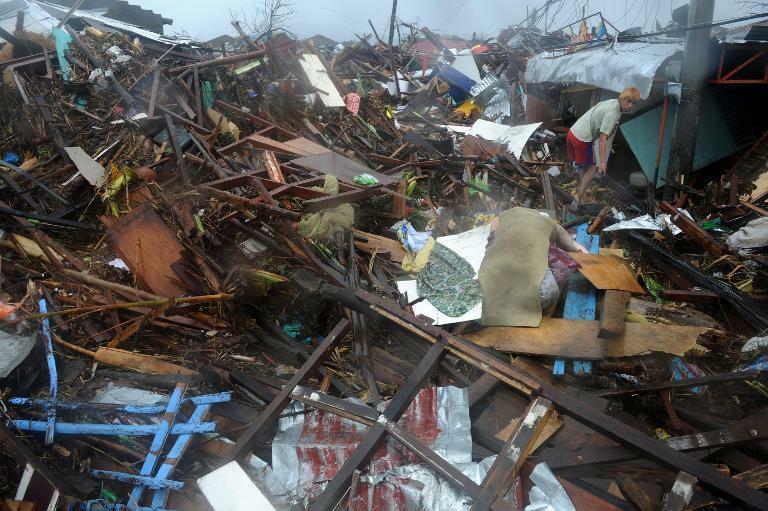 "Tacloban is totally destroyed. Some people are losing their minds from hunger or from losing their families," high school teacher Andrew Pomeda, 36, told AFP on Sunday, warning of the increasing desperation of survivors. "People are becoming violent. They are looting business establishments, the malls, just to find food, rice and milk.... I am afraid that in one week, people will be killing from hunger." President Benigno Aquino said while visiting Tacloban on Sunday that looting had become a major concern, after only 20 officers out of the city's 390-strong police force turned up for work. "So we will send about 300 police and soldiers to take their place and bring back peace and order," he said. Haiyan, which moved out of the Philippines and into the South China Sea on Saturday, made landfall in Vietnam early Monday, US meteorologists said. The US Joint Typhoon Warning Center (JTWC) said in an update at 2100 GMT the storm "is currently making landfall" approximately 97 miles (156 kilometres) east south-east of the capital Hanoi, with sustained winds of 75 miles (120 kilometres) per hour. The typhoon had weakened at sea, striking Vietnam as the equivalent of a category-one hurricane -- the weakest on the one-to-five Saffir-Simpson wind-speed scale. Even so, more than 600,000 people were evacuated, with flooding and heavy rain expected. The Vietnamese government website said Sunday that five people had died while preparing for the storm. Farther north, six members of a cargo boat were also missing off the Chinese province of Hainan, state media in China reported. Up to four million children could be affected by the disaster, the United Nations Children's Fund warned Sunday. "We are rushing to get critical supplies to children who are bearing the brunt of this crisis," said UNICEF Philippines representative Tomoo Hozumi. "Reaching the worst-affected areas is very difficult," he said. "But we are working around the clock." Authorities were struggling to understand the sheer magnitude of the disaster, let alone react to it, with the regional police chief for Leyte saying initial government estimates showed 10,000 people were believed to have died in that province alone. Chief Superintendent Elmer Soria told reporters in Tacloban that the typhoon destroyed up to 80 percent of the structures in its path. On the neighbouring island of Samar, a local disaster chief said 300 people were killed in the small town of Basey. He added another 2,000 were missing there and elsewhere on Samar, which was one of the first areas hit when Haiyan swept in from the Pacific Ocean as a category-five storm with maximum sustained winds of 315 kilometres (195 miles) an hour. Dozens more people were confirmed killed in other flattened towns and cities across a 600-kilometre stretch of islands through the central Philippines. As the scale of the disaster began to emerge, an international aid effort ratcheted up. In Washington, the Pentagon announced that US Defence Secretary Chuck Hagel had responded to a request from the Philippines for military aid and directed the US Pacific Command to deploy resources. President Barack Obama said he was "deeply saddened" and added that Washington was "ready to further assist the government's relief and recovery efforts." UN leader Ban Ki-moon also promised that humanitarian agencies would "respond rapidly to help people in need", while the European Commission said it would give three million euros ($4 million) to help relief efforts. British Prime Minister David Cameron called Aquino to extend his sympathy, and offered an emergency support package worth six million pounds ($9.6 million). The Philippines endures a seemingly never-ending pattern of deadly typhoons, earthquakes, volcano eruptions and other natural disasters. It is located along a typhoon belt and the so-called Ring of Fire, a vast Pacific region where many of Earth's earthquakes and volcanic eruptions occur. But if the death toll of more than 10,000 is correct, Haiyan would be the deadliest natural disaster ever recorded in the country, worse than the 1976 Moro Gulf tsunami that killed between 5,000 and 8,000 people. Haiyan's maximum sustained wind speeds made it the strongest typhoon in the world this year, and one of the most powerful ever recorded. Witnesses in Tacloban recalled waves up to five metres (16 feet) high surging inland. Aerial photos showed entire neighbourhoods destroyed, with trees and buildings flattened by storm surge. The Philippines country director of the World Food Programme, Praveen Agrawal, who visited Tacloban, said the devastation resembled that of a tsunami. "All the trees are bent over, the bark has been stripped off, the houses have been damaged. In many cases they have collapsed," he told AFP. 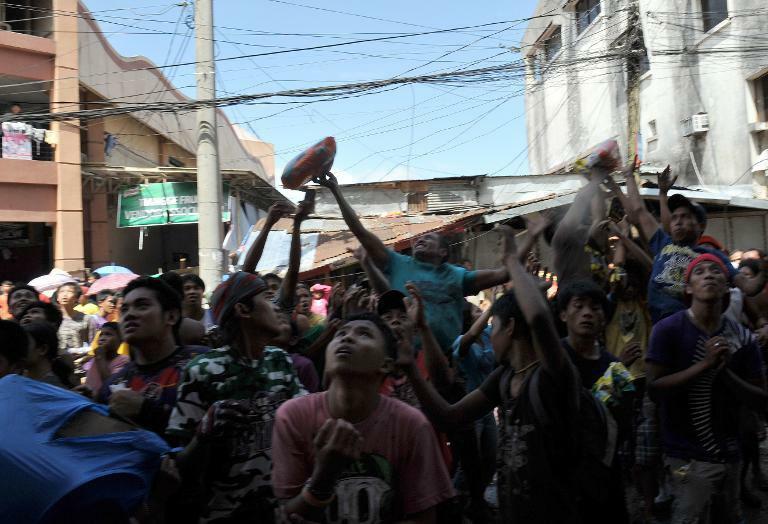 "The huge waves came again and again, flushing us out on the street and washing away our homes," Mirasol Saoyi, 27, told AFP near Tacloban's seaside sports stadium, where thousands of people gathered. "My husband tied us together, but still we got separated among the debris. I saw many people drowning, screaming and going under.... I haven't found my husband."